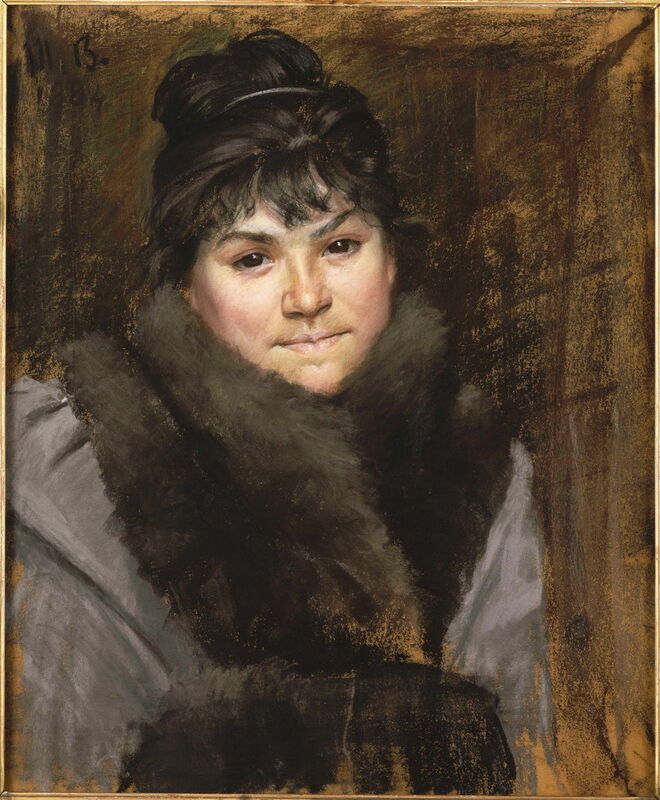 Maria Konstantinovna Bashkirtseva (Мария Константиновна Башкирцева), better known as Marie Bashkirtseff (1858–1884), was Jules Bastien-Lepage‘s most promising pupil. Where he excelled in capturing the people of the countryside, she showed the poor of the cities. Together their paintings were a perfect complement, but together – within three months of one another – they died. She was only 25. Bashkirtseff was born in an affluent and noble family in Gavrontsi, near Poltava in central Ukraine. She grew up travelling around Europe with her mother, eventually settling in Paris. She originally hoped to be a singer, but after an illness ruined her voice, she decided to be an artist. She then studied with Robert-Fleury from 1877, who remained her teacher throughout her brief career, and at the Académie Julian, in Paris. Marie Bashkirtseff (1858–1884), Self-portrait with Palette (1880), oil on canvas, dimensions not known, Musée des Beaux-Arts Jules Chéret, Nice, France. Wikimedia Commons. A self-assured painter from the beginning, she set her sights high and had the ability and drive to paint very well indeed. 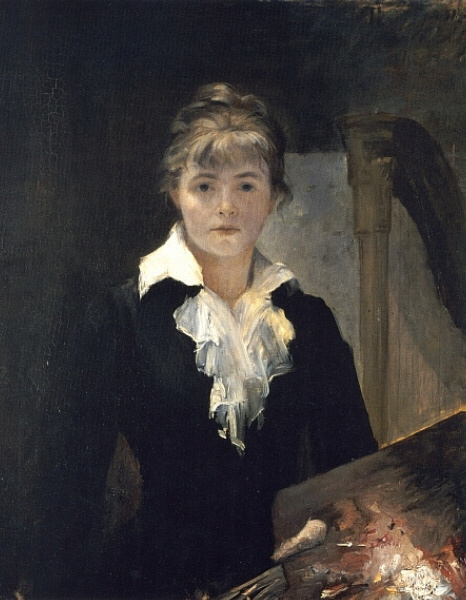 Her early Self-portrait with Palette (1880) was painted in the same year that she first had a painting accepted for exhibition at the Paris Salon, and she was successful again in subsequent years until her death. Marie Bashkirtseff (1858–1884), In the Studio (1881), oil on canvas, 188 x 154 cm, Dnipropetrovsk State Art Museum, Dnipropetrovsk, The Ukraine. Wikimedia Commons. 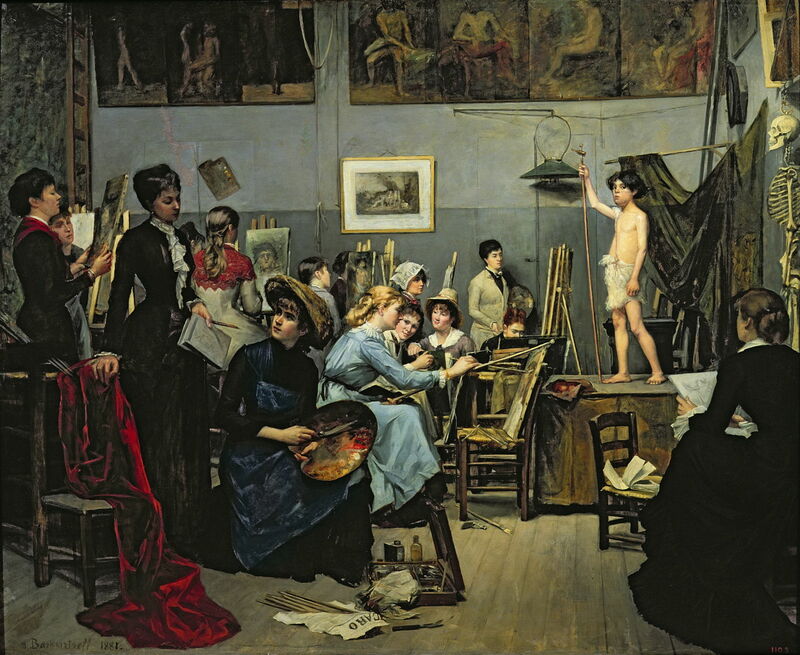 While still studying at the Académie Julien, she painted In the Studio (1881), which gives the clearest insight into what her training was like. Her class was of course entirely female, and the Académie Julien was one of the few reputable schools which accepted women pupils at the time. 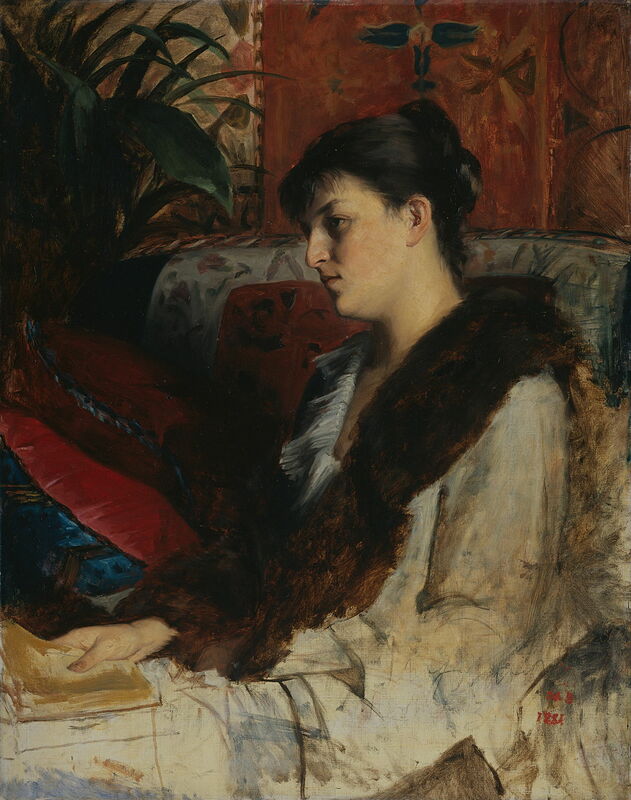 Marie Bashkirtseff (1858–1884), The Artist’s Sister (1881), oil on canvas, 92 x 73 cm, Rijksmuseum, Amsterdam. Wikimedia Commons. Her early portraits were very skilful, if fairly conventional, as is The Artist’s Sister (1881). She started to establish herself in the art scene; it has been claimed that she wrote a column for the mysandrist newspaper La Citoyenne under the name of Pauline Orrel, but this appears to be unsupported by the original edited versions of her diaries. When she was visiting Nice in 1882, she became a close friend of Jules Bastien-Lepage, and he acted as her mentor if not teacher (she described herself as his pupil). She also formed a close friendship with the writer Guy de Maupassant. 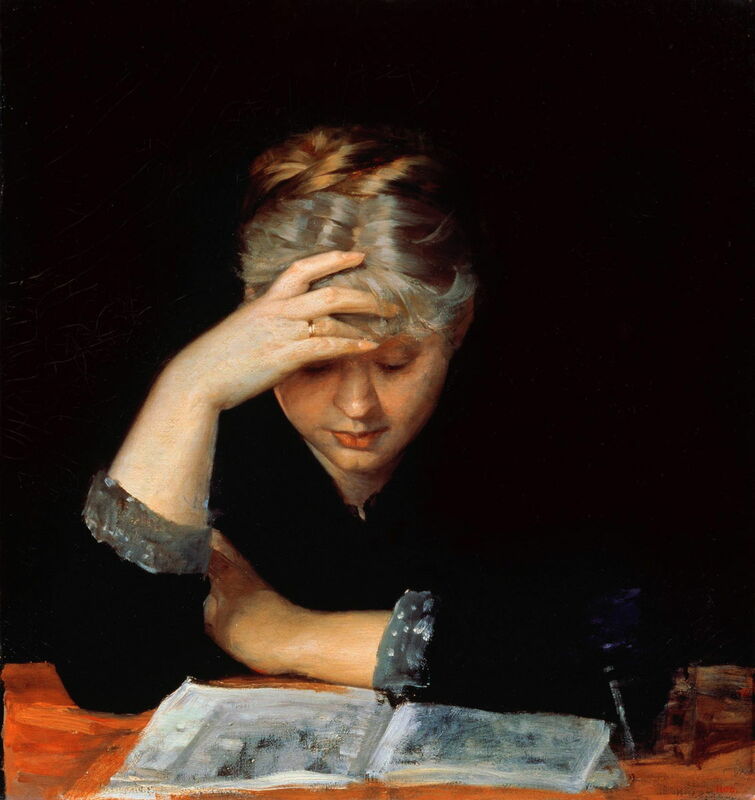 Marie Bashkirtseff (1858–1884), At a Book (c 1882), oil on canvas, 63 × 60.5 cm, Kharkiv art museum, Kharkiv, The Ukraine. Wikimedia Commons. As she developed a more distinctive style in her portraits, so her brushwork loosened. She was an astute observer of women’s life, as shown in At a Book (c 1882), with its emphasis on the model’s unusual hair. Marie Bashkirtseff (1858–1884), Young Russian Girl (c 1882), other details not known. Wikimedia Commons. 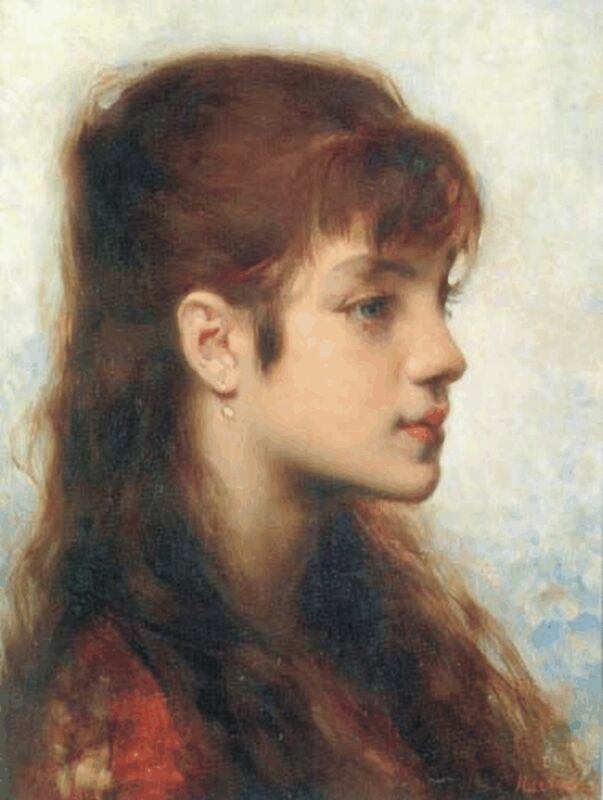 Young Russian Girl (c 1882) is another delicate portrait, although I suspect that the original is not as soft-focus as this image. Although Bashkirtseff declared Bastien-Lepage to reign supreme in the countryside, she felt that she was his match when it came to the urban environment of Paris. 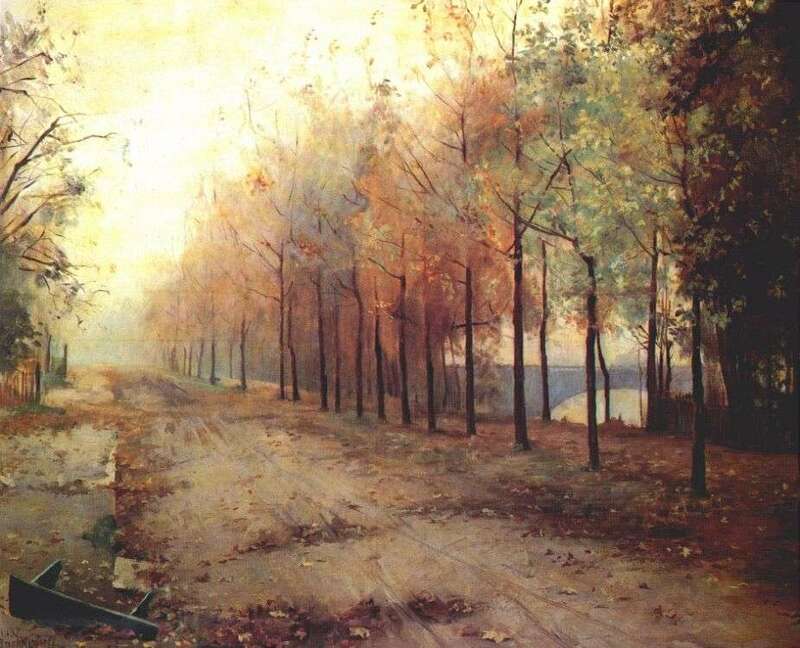 Certainly her Autumn (1883) is an impressive and Impressionist depiction of a row of trees on the bank of the River Seine in the centre of Paris, but is unusual in being devoid of people. The leaf litter, occasional rubbish, and fallen bench strengthen its feeling of desolation in the midst of the bustling city. 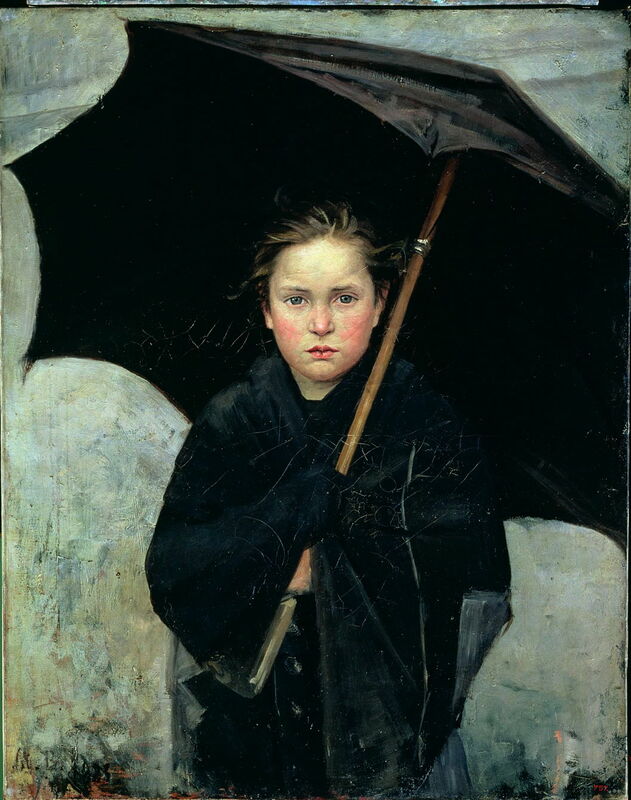 Bastien-Lepage’s compromise of detailed realism blended with more painterly passages shows through in one of her best portraits, The Umbrella (1883). This girl’s tenacious stare at the viewer quickly becomes quite unnerving. That year she was awarded an honourable mention for her painting in the Salon (according to her published diaries). 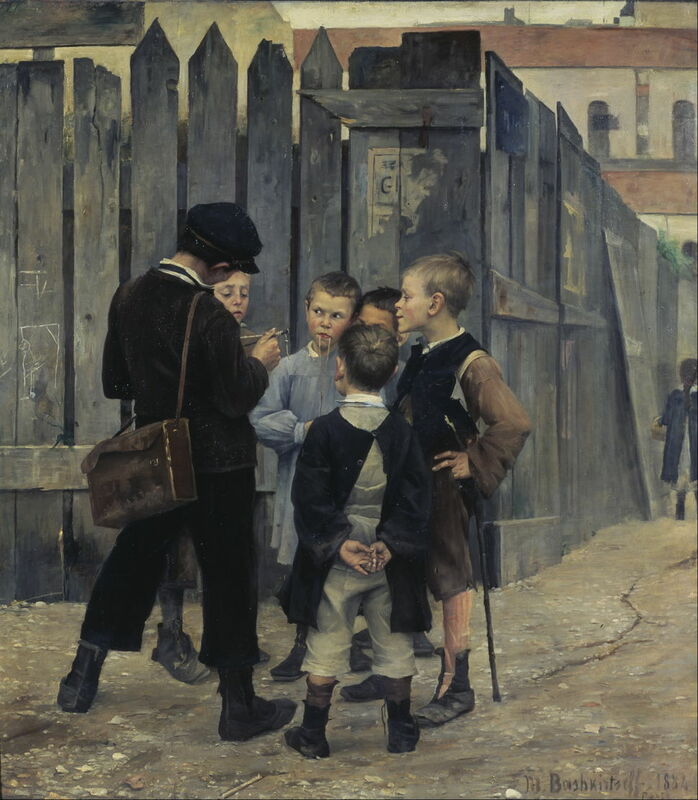 Marie Bashkirtseff (1858–1884), A Meeting (1884), oil on canvas, 193 x 177 cm, Musée d’Orsay, Paris. Wikimedia Commons. A Meeting (1884) finally justified her claim to paint the urban poor, and to match Bastien-Lepage. This painting was quite rightly a great success when it was shown at the Salon in that year, and is probably her greatest work. Marie Bashkirtseff (1858–1884), Portrait of Madame X (1884), pastel and charcoal, 56 x 46.5 cm, Musée d’Orsay. Wikimedia Commons. Her pastel Portrait of Madame X (1884), in the Musée d’Orsay together with A Meeting, was also shown in that Salon. By the time of that Salon in the summer of 1884, Bashkirtseff’s stuttering health was deteriorating rapidly, because of tuberculosis. She died on 31 October, less than a month before she would have turned 26, and less than three months before her mentor, Jules Bastien-Lepage, also died. Her ambition was better fulfilled after her death than in life. Her huge mausoleum in Cimitière de Passy, Paris, contains a full artist’s studio. Three years later, her copious and revelatory diaries were published, and propelled her to international fame. Homage site and virtual gallery. An English translation of her journal, on archive.org. Posted in General, Painting and tagged Bashkirtseff, Bastien-Lepage, painting, Robert-Fleury. Bookmark the permalink.